So many tragic things have happened this week, it can really have an affect on a person. One thing that you really need to be careful about when all of the horror of this week piles on one after another, that you don’t lose faith that God has things in control. Of course we have all heard about the tragic bombings in Boston on Monday, but maybe you haven’t heard about the explosion at the fertilizer plant in West, Texas yesterday. Couple that with the poison laced letters to one of our US Senators and President Obama, and you really do start to wonder if God is paying attention. Well, my Brothers and Sisters, I’m here to tell you that I am not worried about God’s priorities. I know that Jesus is my man, that I love Him, no matter what, and that I know Him and He knows me. How do I know this, you ask? Well, that my friends, is an onion with many layers, so I’ll start at the beginning. My Mom was the oldest child of my Grandparents, and when she was one year old, she was bit by a mosquito and contracted encephalitis. She had to learn how to talk again, she had to learn how to walk again, and she has always been emotional. In the 1960s, my Grandpa was stationed to the Washington, DC area to supervise construction of the maintenance hangar for United Airlines, so my Grandma and all of the family moved to Fairfax, VA. My Dad was living in Vienna, VA, a town close by, and they met on a blind date, fell in love, and were married within six months. Those two things, well before I was born, while not a distinct reason for my faith, still are evidence that God has a plan for me, because all it would have taken was one little thing to happen, and I would not be here today. Cindy has a similar background. When she was born, there was a blizzard that started when they were driving the hour or so to get to the hospital where she was born. Her parents had to make it through that blizzard, and they did. Then, when Cindy was one year old, she developed pneumonia and had to go through a lot of growing again after she was well. As a kid, we didn’t go to Church that much, but that didn’t mean I didn’t know who Jesus was. But truly, I didn’t become a Christian until after my sister was married and Mom and I started going to Church at Round Hill Baptist Church in Round Hill, VA — my sister’s church. I was a late bloomer — I didn’t move out of my parents house until I was 25 years old. Then I moved in with some co-workers in Manassas, VA, and just a few months after that I got a job offer — for a temporary position — with the company I now work for. I went from living at home to living in Manassas to moving to Raleigh, NC in the span of less then a year. My temporary job — it was supposed to be a 30 day job setting up some computers. 30 days became 60, 60 became 90, and before I knew it, I was a temporary going on almost 3 years. But now, I’m still with the same company, 16 permanent years later (nearly 19 if you count the temp time)…how’s that for a temporary job? The point of all of that is that I met my wife Cindy when she was hired to work at the same company. In fact, she had a computer question her first day on the job, and I helped her out. We were friends for a year before we started dating, but once we started dating, we were engaged in less then a month; we were married in August, four months after we started dating; we became pregnant with Sophie in November of that same year, and we had her on June 19, 2001 — almost two months before our first anniversary. I’ve probably lost all of you that have been reading, and I apologize for that. The true reason for why I have such a strong faith comes in this next life event — the birth of Sophie. In June, Cindy got sick; her liver enzymes were completely out of whack, her blood pressure spiked, and she was sick. The important thing was that we had a doctors appointment the day she got sick, so I picked her up and took her in to the doctor. She was immediately admitted to the hospital. The diagnosis: HELLP Syndrome, a rare and particularly serious form of pre-eclampsia. Cindy’s blood pressure — which I saw from the fetal monitor — spiked at 220 over 190 — and things were extremely serious. But despite all of the stress, the anxiety, and the uncertainty — despite all of that, I was extremely calm, both on the outside and on the inside. My Brothers and Sisters, I was that way because of my faith. It wasn’t part of my thoughts, certainly, but looking back, I think I just knew that God was in control, that Cindy was going to be okay, that Sophie was going to be okay, and that it would be all right because He decided it would be. Too many things had happened — both in our lives before we were born, and also in our lives together, to prevent this from happening. To a cynic, an unbeliever, they would be very quick to say it was all coincidence, that there is no way that any one being did all of that. They would say that it was just dumb luck that got us to this stage. To them, I say they are just flat out WRONG — that God has a plan for Cindy, a plan for Sophie, and a plan for me — and that is why everything worked out. Sophie at one day old. Look at her tiny, beautiful fingers. 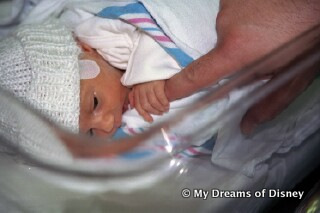 Sophie was born 7 weeks early, weighing a meager 4 pounds, 2 ounces, and measuring just 17 1/2″ long. It was expected that she would need Oxygen to help her breath for some time, but within hours of being born, she had pushed the breathing tube away repeatedly, and never needed it again — her lungs were that well developed. Sophie ended up needing to stay in the hospital in the NICU ward for just two weeks. It was the hardest thing Cindy and I ever did — leaving the hospital without our baby — but it also gave us time to learn the things that new parents to learn — how to properly burp your baby, how to properly change her diaper, and so on. We learned from the true experts — the nurses! So, as tragic as the events that have occurred this week are, as inexcusable as the bombing in Boston was, the beauty of it all was how the people responded, both in Boston, around New England, and across the country and even the world. Despite the tragedy, despite the lunacy with the poison in the letters, and despite this latest tragedy in Texas, despite all of that, my friends, the one constant that is God. While this is hard to deal with, especially for those that have lost loved ones this week — the way to dealing with our grief is by turning to God, and letting Him take on that burden for us. It’s what He has already done once, over 2000 years ago, and what He will continue to do for those of us that believe in Him. My friends, I thank you for taking the time to stick this out, to hear what I had to say, and for your prayers for everyone affected in these horrible tragedies, plus those that are listed in our latest Prayers for the Week post. Faith. It’s a beautiful word, a powerful word, one we should all know. 63 Days til Disneyland – Tarzan’s Treehouse! Earlier in our countdown, I wrote about the Chip ‘n Dale Treehouse for Day 72 of our countdown. In that post, I speculated that the Chip ‘n Dale Treehouse might be the closest thing to the Swiss Family Robinson Treehouse at the Magic Kingdom — but I had totally forgotten about Tarzan’s Treehouse at Disneyland! Today for Day 63 of our countdown to Disneyland we will explore more about Tarzan’s Treehouse. So, when looking at the website about this attraction, which stands 80 feet high — quick trivia question, “How tall is the tree for Swiss Family Robinson Treehouse?” — and I now realize that this attraction is closer in similarity to Swiss Family Robinson then Chip ‘n Dale. What I like is the Tarzan theming you have here — which you don’t find at Walt Disney World. Tarzan hasn’t been seen at WDW — that I remember anyway — since Tarzan Rocks closed at Disney’s Animal Kingdom on January 21, 2006. So tell me please, what do you think about Tarzan’s Treehouse? Do you like it or leave it? Please let me know in the comments below, or on our Facebook Page. Thanks! Now for that trivia question. The Swiss Family Robinson Treehouse is 60 feet tall and 90 feet wide, which is shorter then I thought it was! As a result, Tarzan’s Treehouse stands taller! Thanks for stopping by! Check back tomorrow for some exciting posts from Disneyland and Walt Disney World!